DNA (Deoxyribose Nucleic Acid) is our genetic information and contains all the instructions to make a human and for our bodies to function correctly. Your DNA is like your thumbprint. It is yours and yours alone. Unless you have an identical twin, no one else on the planet has exactly the same DNA as you. Very simply, DNA is the substance which carries the code or language of the body’s instruction manual. Our bodies are made up of millions of cells, but we all began as a single cell. In the ovaries of the female reproductive system are the egg cells. If a sperm is successful in fertilizing the egg a series of cell divisions take place, it first divides into two cells which in turn divide to give four cells and so on. The fertilized egg now becomes an embryo and moves down the fallopian tube towards the womb where it will grow and develop. Through this amazing process supported by the nurturing environment of our mother’s womb, most of us end up the right shape with all our organs in place and functioning as they should. How does something so small contain all the instructions to make your whole body and keep it working? That is answered in the chemical makeup of DNA. If you think of your genome (all your chromosomes) as the book that makes you, then the genes are the words that make up the story. The cells use the information in the genetic instruction to make proteins, which do most of the real work in the body. The DNA in your genes tells the cell what amino acids (the building blocks of protein) to put together to make the particular protein coded for by each gene. 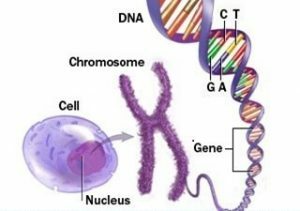 There are only 4 different letters that make up the genetic instructions; these “letters” are called DNA bases: adenine (A), guanine (G), cytosine (C), and thymine (T). It’s hard to believe that an alphabet with only four letters can make something as wonderful and complex as a person! Each code of 3 letters tells the body which amino acid is needed next in the protein. There are 20 amino acids in total, which seems hardly enough to produce the huge variety of proteins you need to build an organism. But because the amino acids can be arranged in any order or length, there’s a staggering number of different possible combinations – too many to even imagine! Genes are the material “stuff” in which the genetic instructions are written (the paper and ink). If there is a change or spelling mistake in the writing of the instruction manual, then the body is unable to function correctly because it has not received the correct instructions. The functioning of our bodies requires that many thousands of genes work together. Changes or spelling mistakes in different genes have resulted in many different genetic conditions, some of which cause the features of Ectodermal Dysplasia. The effect of a change in our genetic code will depend on what the change is and which gene the change is in. It is very important to remember that a person cannot choose or modify the genes that he or she has, and that the events of pregnancy do not change the genes. Thus, parents who have a child with ED should not think that they did anything to cause the change in the gene and should not blame themselves in any way for having a child with a genetic disorder. Advances in human genetics are expected to benefit us in many ways. Improved understanding of the genetic basis of genetic conditions will, in the long term, lead to better treatments. Many families find it helpful just to understand what has occurred and why. We cannot answer all the questions you might have, but to understand more about genetics, inheritance patterns and how things can and do go wrong please follow the sections listed on the left.